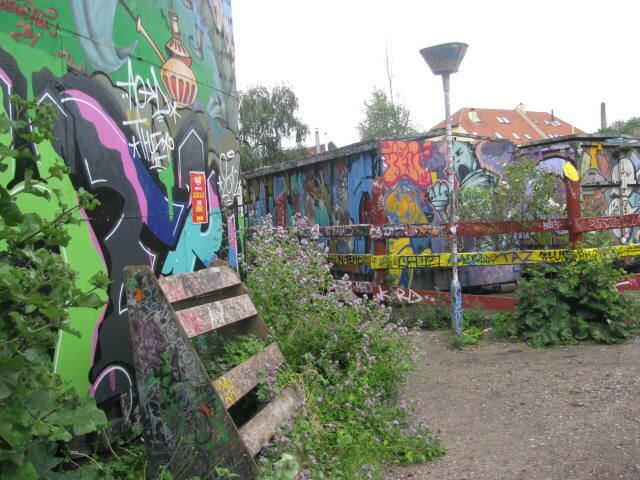 Christiania is a self-proclaimed autonomous neighborhood in Copenhagen, Denmark. Approximately 800 people reside there. If you are in the area I highly recommend visiting. I should say it wasn’t the cleanest place I’ve ever been, but captivating. Please note that in some areas photographs are not allowed and if you try to break the rules, the residents will say something. I was fascinated by all the artwork, including these buildings. This entry was posted in Travel Photos and tagged Christiania, Communes, Copenhagen, Denmark, Europe, Graffiti, Life, Nature, Photography, Travel, Travel Blog, Travel Journal, Travel Photo. Bookmark the permalink. Think I saw a documentary about this community – interesting! It’s a unique place. Wouldn’t want to live there, but loved visiting it. This is amazing! I hope to one day have a travel blog of my own. I wish you luck! And start now and explore your own area. It’s amazing what you see when you try. Wow, there’s a riot of colour going on there! Interesting. It matches the area that’s for sure. Wow. I’ve always wanted to do graffiti art but that’s not too welcome in the Philippines. This is an amazing picture. They don’t allow it in some parts of the country? This particular area is different from the rest of the city. They have claimed they don’t belong to the EU and the laws. They actually have a sign over the entrance saying that you are now leaving the EU and then when you exit they inform you that you are reentering the EU. Really? There’s the distinction. So in EU sanctioned places you can’t paint graffiti or you just can’t just take random pictures? Well you see graffiti all over Europe. I think some projects are sponsored by governments and some are just done by artists. But this area is different since the people who took over the area declared they weren’t part of a government. You can’t take pictures in some parts since the are illegal activities taking place, such as drug use and those involved don’t want photographic evidence. Oh, that’s why. I get it now. So the declaration was not made by the government but rather people in the area. I thought it was more of a policy the govt propagates, similar to our situation here. Yes, I’m still a little unclear as to how the people could take over a spot of land, but they did. It sounds similar to the NPA set-up here in the Philippines. I haven’t heard of the NPA set-up. Will look into it. Because I’ve always wanted to do graffiti art but I never really found the time or courage to do it, I’m reblogging this photo to remind myself to take a chance one day. That day will be when I have my own wall to cover and when I’m not too insecure about showing my work. Here’s to all the confident artists who made this possible. This wasn’t a banned area. You can take photos of the buildings, not of the people breaking the laws. I try not to offend or annoy people when I take photos. Not sure I’m always successful, but I try. Why are you not allowed to take photos in certain areas.?? There are some areas where the residents are partaking in illegal activities and they don’t want photographic evidence. Seems like a throwback in time. That is the feel of the place. That’s not something one sees much. I remember an old concrete support wall along one of the roads in the town where I grew up. College students were always “decorating” it, then it would be painted white again–only to have graffiti appear again come the weekend. Were any of the artists any good? Hadn’t heard of this place before. Reminds me of La Boca in Buenos Aires! Well now, I need to go so I can compare! Nice picture, TBM! Christiania looks like a fascinating place. It is. the people and art make it really unique. How long is the layover? I don’t think I’ve ever ventured out of the airport during a layover. It’s either too short or I’m too tired to run around. it’s interesting when a group of people get together and reject the outside world. all the color seems like an expression of hope that the color can reside inside as well. but they don’t seem to survive for long for some reason. I’m always fascinated to see how long the “new” place becomes too much like the old. People are people, good and bad.